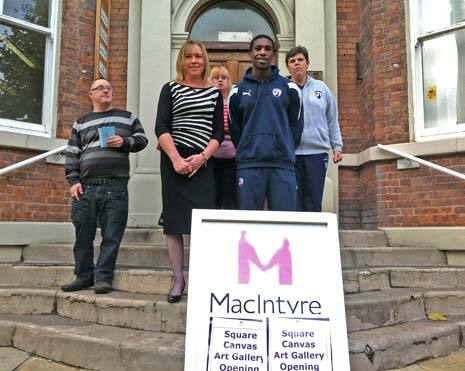 Rising young Spireites star Tendayi Darikwa attended the launch of a display (below) to mark 'Celebrating Chesterfield' - a ground-breaking project exploring what is great about community life in the town. The project, which is based at the MacIntyre premises in New Square in the town centre, has been undertaken as part of the charity's aim to promote greater inclusion and involvement in community life for the people they support. Adults with learning disabilities have been supported to conduct over 160 interviews with prominent local figures including John Croot from the Chesterfield FC Community Trust, John Burrows Leader of Chesterfield Borough Council and Chesterfield MP Toby Perkins MP, along with family members, friends and local groups in the town. "The project shows how people can work together to ensure that everyone is included in their local community and can benefit from what the town has to offer," said Clare Tattersall, who is Head of Service at MacIntyre. Members of the public are welcome to view the display at MacIntyre's New Square base, next door to the Yorkshire Bank. The display, which will be on until the end of January, is open from 9am to 3pm, Monday to Friday. For further information on 'Celebrating Chesterfield', please contact Clare Tattersall on 07825 620357 or email clare.tattersall@macintyrecharity.org.